Govt. Of Pakistan Railways Department Karachi Sindh. Qualification: BSc Electrical/Electronics/Telecommunication Engineering, duly registered with Pakistan Engineering Council (PEC), having at least 8 years experience in Signalling Engineering Works, Design and maintenance experience, ability to read and counter check the interlocking Yard diagrams etc and preparation of Estimates, Tender documents and completion reports/plans. Signal Engineer B.P.S 18/17 01 No. 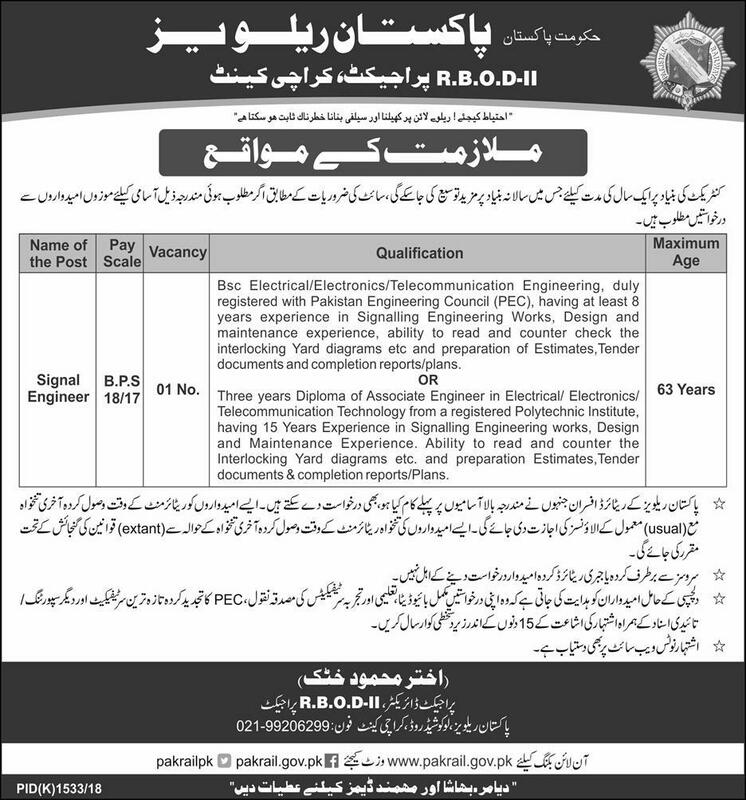 Interested candidates apply along with the application attested copies of Education/Experience Certificates, CNIC, Domicile, and other relevant documents to the Undersigned office within 15 Days from Publication of this Advertisement. Pakistan Railways, Lokoshed Road, Karachi Cantt.